Do you need to know how to repair these plastic spacers that are on your kitchen roll-out drawer slides that keep breaking? I have a solution that will fix the problem so that you will never again have to deal with the nylon spacer blocks collapsing. The professional way to repair your problem is going to cost a little more than just replacing the small blocks with new ones. The extra expense will be worth it because you will never again have to be concerned about the drawers falling out because the supports might break. You will need to measure the inside depth of the cupboard and the thickness of the gap needed to replace the blocks. What I mean is just measure the piece of nylon. This MEASUREMENT MUST BE exact, no bigger and no less. You are now going to replace the plastic pieces that keep breaking with the best, long-lasting, alternative material, known as real wood. DON’T waist your time trying to find another solution or an easier softer way. I’ve been repairing kitchen cabinet drawers for over thirty years and this is the best way to fix these broken pull-outs. You can either fabricate these boards yourself or hire a cabinet maker to make the roll-out drawer block for you. Either make sure they match the interior of the cabinet or have a pleasing “contrast” appearance if you are use a clashing material. This is a great opportunity for adding additional roll-out drawers to your kitchen cabinets while you are taking on the project. Before removing the plastic spacers and drawer slides from the interior of the cupboard, measure the distance of each slide from the bottom of the cabinet to the bottom of the drawer slide. Either draw a diagram of where they will need to be reinstalled or just put the dimensions on paper. Count the number of blocks of wood that you will need and make a note of how many left sides and right sides that there are. You will need to fabricate the new drawer spacers in lefts and rights. Make your blocks one quarter (1/4”) of an inch less in than the depth of your kitchen cupboard. The new supports for the pull-out drawers should be manufactured three and a half (3-1/2”) to four inches (4”) in height. They must be this large to allow enough room to screw them to the inside of your kitchen cabinets. You may have to make a couple of them less in height due to the locations of your hinges. Measure the thickness of one of the old nylon (plastic) drawer spacers that is still in tact (not disintegrated) and this will determine how thick the replacement boards should be. 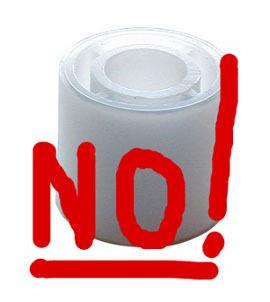 DO NOT make the thickness any thicker than the nylon spacers, not even one sixty fourth (1/64”) of an inch. If you make them thicker your drawers may not roll smoothly. Obviously, you will need to remove all of the broken plastic spacers and drawer slides from the interior of the kitchen cabinets. IMPORTANT-Mount the drawer slides to the new pieces of wood. If the front of the slide needs to be recessed back three quarters of an inch (3/4”) to allow for a drawer face that overhangs, don’t miss this critical observation. If you do not recess the slide back from the roll-out blocks edge, you will have to redo the entire project. Screw the drawer slides onto the new spacer blocks so that they are flush with the bottom edges. Measure up from the bottom of the cabinet dimension where the bottom of the drawer slide spacer should be installed and ADD the height of the block and make a pencil mark. Using a carpenters square drawer a line from front to back on the cabinet side. Pre-drill holes in the wood spacers for mounting them to the cabinet sides. Hold the top of the blocks flush with the lines and screw the fast to the cabinet sides. If the drawers are too loose, then you must add thin shims behind the blocks. If the drawers are too tight, you will need to trim the drawer sides following the height of the slide as a guide. You can also trim down the spacer blocks. HOPEFULLY, you paid attention to my “DO NOT” message when I instructed you to make the spacers the exact thickness of the nylon (plastic) spacer blocks. Here’s a thought, sometimes it’s necessary o consider changing the kitchen drawer slides because they got bent over time as the plastic spacers were breaking. I have fixed many situations where the plastic nylon spacers on roll-out drawers have collapsed using the method I just described. It is a great alternative to re-installing the same type of nylon blocks This way of repairing roll-out drawer spacers that keep breaking works like a charm every time. It’s a permanent fix for broken pull-out drawer slides.